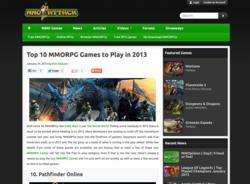 MMO Attack, a gaming website and video channel that focuses on massively multiplayer online role-playing games (MMORPGs), released its Top 10 MMORPG Games List for 2013. We want our community to play the newest, hottest games and that's our goal in putting out this and other lists concerning the MMO and MMORPG market. MMO Attack, a leading gaming website that focuses on massively multiplayer online role-playing games (MMORPGs), released its Top 10 MMORPG Games List for 2013. With the renewed success of the MMORPG market in 2012, this new featured article aims to give MMORPG fans a look at what games they can expect to be reading about and playing in 2013 and beyond. "We feature tons of great MMO games on our site and it's often difficult to sort through everything that's going on in terms of news and reviews and game plays in order to find what games we should be looking at in the future," said Kirk Wallace, MMO Attack's Social Marketing Manager. "This list is not a be-all end-all, but a great place for our readers to start and think about upcoming games that they will be playing. In the end, we want our community to play the newest, hottest games and that's our goal in putting out this and other lists concerning the MMO and MMORPG market." Many of the games on the list are either in beta, alpha or pre-alpha stages, which poses a unique problem in that there may only be developer blogs, preview trailers and/or press kits to determine which games make the list. In the end, the buzz generated for these upcoming MMORPG games was a determining factor for their addition to the page.